Social Security is different for educators. It’s more complicated, and the rules aren’t always fair. If you’re an educator, when your turn comes to file for Social Security benefits you may need to fight for what’s rightfully yours. But first, you need to understand the rules! Thankfully, it’s not that hard. In this video I’ll help to simplify the rules. – Can You Expect to Collect Spousal Benefits? – Will You Be Eligible for Survivor Benefits? Hey everyone. This is Devin Carroll. Since I founded Social Security Intelligence back in 2014 there’s been one topic that’s gotten me more questions than anything else and it’s about social security for educators so I’m really excited to do this today. Hope you find a tremendous amount of value in it. First, I’m not part of or affiliated with the Social Security Administration or any other government entity. Also, I don’t provide any tax or legal advice and I hope you don’t take any of this as such. Before we jump into social security for educators I’m going to make an assumption and that assumption is that you already have a good grasp of the social security basics but if you don’t I have good news. At the bottom of your screen you’ll see a link that you can click on. That’ll take you to my video on social security basics. That goes into details about eligibility for benefits, how those benefits are calculated, full retirement age, spousal benefits, so on and so forth. Let’s get this started. What’s so different about educators and what makes it so complicated that I get so many questions on this. Well, first, I think it’s important to point out that not all states have these strange rules for their teachers. Only the states in red, for the most part, do not participate at all in social security. Those states in dark blue partially participate and it varies by school district, and then the states in light blue, teachers are covered by social security. Now there’s a caveat to make about the states in red. The general rule is that teachers are not covered in those states but, for example, in my home state of Texas there are several school districts gathered throughout the state that do participate and it’s those types of districts in any of the states where do teachers do participate that makes it really complex because if you’re teacher who’s either had employment outside of education and then came into education as a second or third career or maybe you’ve left education and that was your first career or if you taught, for example here in my hometown of Texarkana, we have teachers that teach on the Arkansas side where they pay into social security then they move to the Texas side and they do not pay into social security and it really makes for a complex situation when you’re trying to plan for your retirement. To make this make sense as much as it is possible so if the following applies to you there are some additional social security rules. First, if you have employment where you did not pay social security taxes and you qualify for a pension from that job. Now, right now the way the laws are written that second part has to happen. So, you can’t just have employment where you did not pay social security taxes. You must have qualified for a pension from that job. If this applies to you there are two rules that you need to know about. The first is the Windfall Elimination Provision. 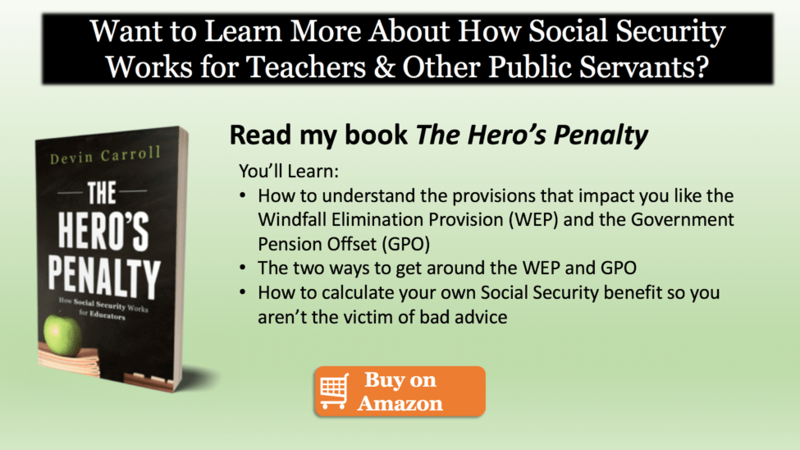 The Windfall Elimination Provision only applies to the social security benefit from your work history so if you’ve had other employment maybe outside of teaching or before you taught or maybe you left teaching and now you’re doing something else where you’re paying in social security but you also have a pension from the time you spent as a teacher or in education the Windfall Elimination Provision will apply. Then there’s the government pension offset and the government pension offset only applies to your social security spousal for survivor benefits. Now the reason it’s important to keep these two distinctly different is that there are different calculation methods for how much the reduction will be. First, let’s jump into the Windfall Elimination Provision and take a look at it. Now remember it only affects your own benefit. It cannot be more than one-half of your teacher’s pension. However, this is capped at a maximum of $428. Now that’s the number for 2016. It changes every year generally increases so you’ll see that change in the years ahead. Now, there is one caveat to the Windfall Elimination Provision. If you have both the Social Security Administration terms as years of substantial earnings the effect of the Windfall Elimination Provision starts to go away. If you have 20 years or less of these substantial earnings which we’ll get to the definition of that in just a moment you’ll see that the maximum Windfall Elimination Reduction ,in the right had column, is $428 so the full amount but if you have 21 years of substantial earnings that’s general earnings from outside of teaching or outside of education that amount starts to come down and at 22 years it’s $342 all the way down to 30 years at which point the Windfall Elimination Provision no longer applies. Now, when we get to this everyone always wants to know so what’s substantial earnings and what qualifies, just how substantial do these earnings need to be? The Social Security Administration publishes a table that says exactly how much these earnings are and they may not be as much as you think. For example in 1980 substantial earnings was $5100. It’s possible that you may have earned that just from outside work, part time employment or something like that. In the year 2000 it’s $14,175 all the way down to 2015 and 16 it’s $22,050. To summarize the Windfall Elimination Provision, first, do you have a pension from work with no social security tax and do you have less than 21 years of substantial earnings. If the answer to both of those is yes then the Windfall Elimination Provision applies to you. The next rule that you need to know about the Government Pension Offset. Remember, it only affects spousal or survivor benefits. The amount of the offset is two-thirds of your teacher’s pension. So, if your teacher’s pension is $3000, it will offset your social security spousal or survivors benefit by $2000. Now, this one is a little bit more complex than the Windfall Elimination Provision which I consider to be somewhat straightforward. It’s either $428 or it goes down slightly until its nothing but this, the Government Pension Offset has to be able to completely wipeout a social security benefit. Let’s look through an example here. Let’s look at my friend Michelle. Michelle worked as an accountant with her husband in an accounting practice they own until a few years in she figured out that she just really didn’t like accounting and so she left, wanted a challenge and decided to be a teacher so for the next 30 years she taught. She retired at 66 and her husband thought that idea was great and he retired as well. She started getting her TRS pension, $3000, and he filed for social security and started getting his check for $2300. Let’s walk through the Government Pension Offset reduction formula. If her TRS pension is 3000 and we know that the reduction is two-thirds of that that means that there is a $2000 reduction applied to either survivor or spousal benefits. Now, if you’ve watched my social security basics video you know that spousal benefits are about one-half of the higher earning spouses benefit and survivor benefits are 100% of the higher earning spouses benefit when they are deceased. If we look at this example here and when we take his social security benefit of $2300 so under normal circumstances she would be entitled to one-half of that, $1150. However, in this example remember there’s a $2000 reduction so she’s not going to get any spousal benefits. Now, if he passes away she is entitled to a survivor benefit which again, under normal circumstances would be 2300 but because of the application of the Government Pension Offset it would reduce that amount by $2000 leaving her with a $300 survivor benefit. Now, this is an area that a lot of people talk about and talk about how it’s not fair and you know what, I kind of agree with that. If Michelle would have stayed at home instead of being a teacher she wouldn’t qualified for that full survivor benefit so I get it. Now, there is one workaround to maneuver by the Government Pension Offset and it’s called the last 60 month rule and here’s what it is. If you work in covered position which is your paying social security tax and you’re covered under the same retirement plan, for example Texas TRS, and you do that for 60 months in a row the Government Pension Offset will not apply to you. Now, here’s the way this works. Let’s say that you’re teaching in the Texarkana Independent School District and for the last 60 months of your career you decide to move down to San Antonio, take a position with their school district where they do participate in social security and you work for 60 months you would not be subject to the Government Pension Offset. So the question is, is it worth it? Let’s work through some numbers and how would you decide for yourself. Let’s take, for example, a spousal benefit of $1000 per month with 2% annual cost of living adjustment over a 20 year lifespan so that spousal benefit is what you would not be eligible for if the Government Pension Offset applied to you but if you could get out from under it it would be and the value of that spousal benefit over your retirement lifespan would be $291,000 and some change but let’s say that the higher earning spouse in your family passed away and your survivor benefit was $2000 a month with that same annual cost of living adjustment over that same time period and getting that extra survivor benefit would be worth $583,000. Now there’s a lot of factors that go into that. Those are rough numbers and you certainly shouldn’t take those as the basis for deciding should you do that or not. You need to get some help to make sure that strategy is right for you. To summarize, if you have employment where you did not pay social security tax and you qualified for a pension form that job, the Windfall Elimination Provision will most likely apply to you and that covers social security benefits from your work history. In addition, the Government Pension Offset will apply and that covers social security spousal or survivor benefits. I hope you’ve enjoyed this presentation and now maybe understand the Windfall Elimination Provision and the Government Pension Offset just a little bit more. I’d like to invite you to stay connected with me. If you’re on Twitter you can find me at Devin A. Carroll. If you’re on Facebook Devin Anthony Carrollll. Find me on the blog, socialsecurityintelligence.com and even when you’re watching this we have a pod cast luncheon soon bigpictureretirement.net. Thanks again for watching. Have a great day.